On Friday (April 21st), former “That Metal Show” host and comedian Don Jamieson will release his new comedy album, Communication Breakdown, via Metal Blade Records. 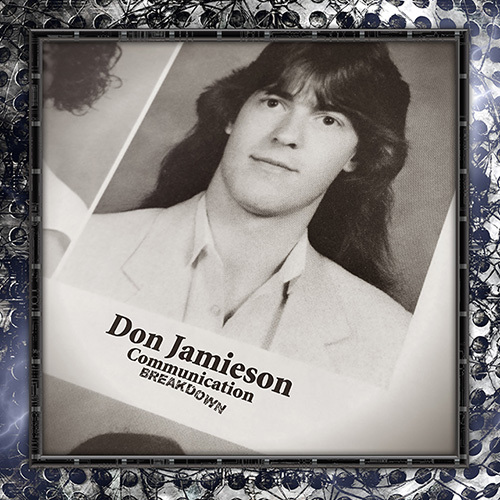 Recorded at The Funny Stop in Cuyahoga Falls, OH, Communication Breakdown‘s title and cover come from Don‘s Rutgers University senior yearbook photo. Don explains: “My young nieces and nephews found the photo at my mom’s house and starting texting me how funny it was, and when I saw it again after so many years, I agreed! I majored in communication, so it was just a matter of adding the ‘Breakdown’ to it, which is obviously something you never want to happen in comedy.” For a preview of Communication Breakdown, the track “Weed, Cigs, Election 2016″ can be heard at: metalblade.com/donjamieson – where the album can also be pre-ordered, and the previously released track, “Kiefer”, can be streamed. 08. Where Have All the Rock Stars Gone? Named one of the top 10 metalhead comedians by Revolver Magazine, Don has captured some of his most irreverent work to-date on his third album, Communication Breakdown. Don explains: “This album has tons of jokes but really revolves around 4 or 5 longer stories, which is something I’ve never really done before. I usually just like shot gunning jokes like beers at a frat party, but this time around I tried something a little different. It took a while to develop them for the stage but am really happy with the way they turned out, particularly the track ‘Kiefer’, which is a true story about a crazy night with the ’24′ actor.